When it comes to buying a pool ladder or replacing your old pool steps there are a few things you should consider before plunking down your cash. Budget, pool size and ergonomics are just a few things that can be factored in when closing in on your final decision. Future plans for your backyard as well as future plans for your family may also play a role in choosing the best ladder for your project. Of course preferences come into play based on individual likes making your selection different from someone else’s. Things like styling, color and brand loyalty my be a factor to you. So we did something a little different to help you out. How we came up with our results was by asking everyone here at North Florida Above Ground Pools plus a few other pool pros to vote for their choice on the different types pool steps. We then counted the votes and wrote the comments below. So I’m going to give you the results for each category based on what seems to last the longest, feel best and will fit the majority of what most people are looking for. I will include links to the whole selection of ladders so you can compare all the different models yourself. But before we get to that we should elaborate on the different types of ladders and steps and what makes them different. All pool ladders and steps typically fit into four basic groups. 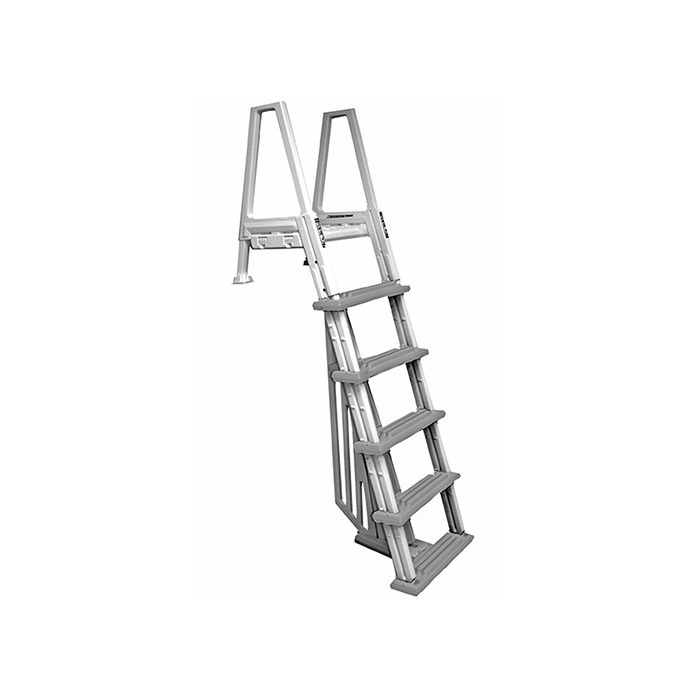 There is the A Frame Ladders, Deck Ladders, In Pool Steps and Entry Systems. Each group is used for a particular purpose and there are several brands in each group. This may sound complicated but it’s really not. A Frame Ladders are designed to allow bathers to go up and over the pool wall then down into the water. These types of ladders are used on pools that are completely out of the ground and both sides of the ladder are needed. Some A-Frame ladders can pull double duty and be converted into a deck ladder if future plans call for it. The right call here could save you from making a second purchase down the road. Deck Ladders are used for pools where a deck is the point of entry into the water. Deck ladders are one sided and only go from the deck down into the water with no outside ladder portion included. They are fastened directly to the deck and or pool top ledge for stability. These are good for someone with an existing pool deck or someone who plans to build one immediately upon completion of their new pool. In Pool Steps are much like a deck ladder in the there is no outside portion and the are also attached to the deck and or top ledge. 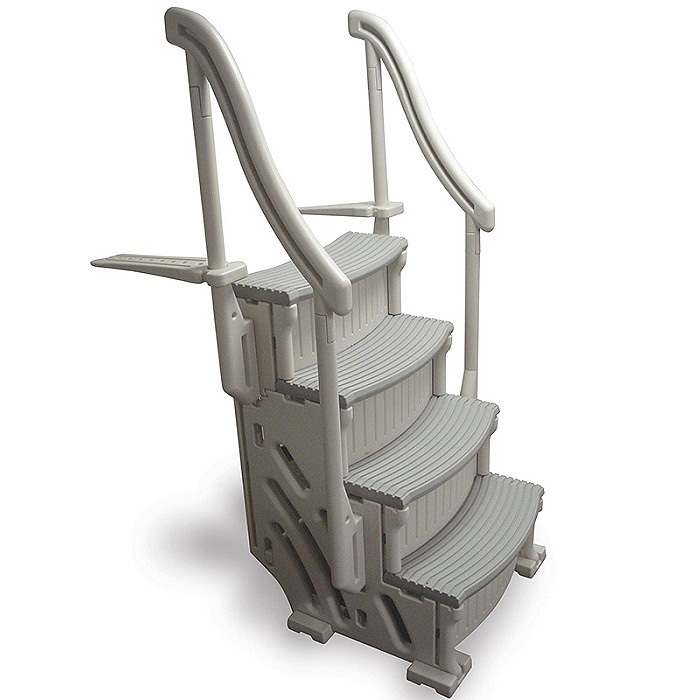 The primary difference is that in-pool steps use steps instead of rungs for footing. This makes for a much safer entry and exit from the water as your feet cannot slip off the step like it can the ladder. Another advantage of the in pool step is that they tend to enter the water at a much more comfortable angle. Steps are usually less steep so climbing them is easier for many people. If using an in-pool steps in a small pool, consider how far the step may protrude into the pool and consume floor space. Entry Systems are most often a combination of in-pool steps with an outside ladder for entry. These are obviously used where the pool entry is from the ground level. The main reason most entry systems use a ladder on the outside instead of another step is safety and cost. Federal law mandates that access to the pool must be restricted when it’s not in use. 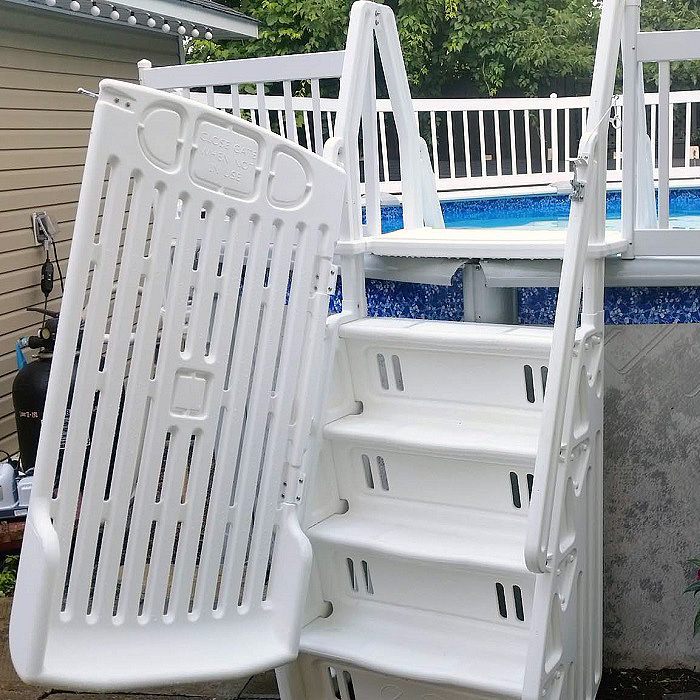 The outside portion of the entry system of ladder must fold up, latch and lock, be removable or employ some other method of making the pool safe and prevent un-authorized access. There are a few entry systems available that have steps on both sides for the easiest of entry but these often become costly. Much like the A-frame ladder many pool entry systems have a removable outside entry portion if a deck becomes a reality. For the best A-Frame pool ladder we chose the old tried and true Confer 7100X. This ladder hasn’t changed much in decades and it hasn’t needed to. If it works it works so don’t fix what isn’t broken. Sure, there are fancier ladders and more expensive units for your choosing but this isn’t what this is all about. The choice here is for best overall and budget and bang for the buck must always be factored in. Why It’s Good- Made in USA by Confer Plastics in Tonawanda New York. This is a very old company that has put out good products for many years. The quality of the ladder will ensure decades of use. It’s not flimsy or rickety. This ladder fastens to the top rail of the swimming pool for a very stable attachment and can be converted to deck ladder if needed. This ladder fits most any 48″-54″ Hard-wall above ground pool and also holds 300lbs. This ladder has the anti-entrapment barrier to keep kids from getting caught behind the ladder. Lastly the rake is good making for easy climbing and the trends are wide and flat. A great solid basic pool ladder affordably priced. For the best pool Deck Ladder we chose the Confer 6000B. Like the A-Frame ladder we selected the deck ladder hasn’t changed much either. Like I said before, if it works it works. But unlike the a-frame ladders there isn’t many out there that are any fancier, in fact it’s the opposite. But like ladders it’s still about what’s best overall and the bottom line, price. Why It’s Good- Made in USA by Confer Plastics in Tonawanda New York. This is a very old company that has put out good products for many years. The quality of this deck ladder is better than the others. It’s not flimsy or rickety. 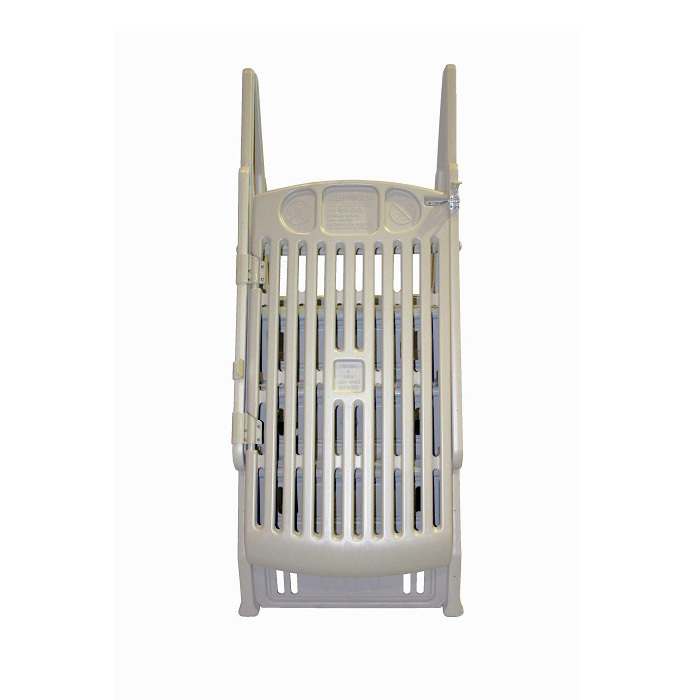 This ladder fastens to the top rail of the swimming pool or fastened to the deck for a very stable pool attachment. This ladder fits most any 48″-54″ Hard-wall above ground pool and also holds 300lbs. This ladder has the anti-entrapment barrier to keep kids from getting caught behind the ladder. Lastly the rake is good making for easy climbing and the trends are wide and flat. It’s just like the a-frame version but with no outside portion. 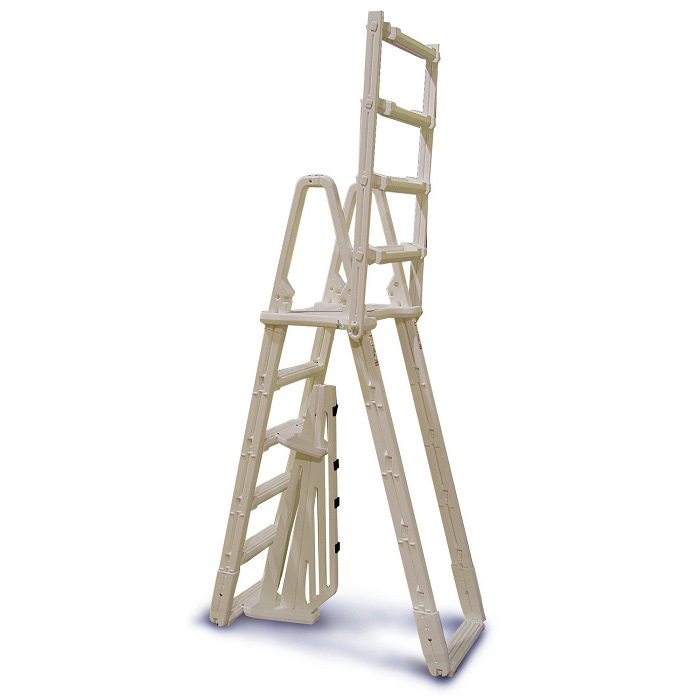 A great solid basic deck ladder at only a few dollars more then the very common and hard to climb straight up and down deck ladders. You know, we didn’t realize until after our votes were counted that Confer took three of the four spots for best pool ladders and steps. When I asked everyone why they chose Confer over the others the most common response was feel. What they meant was that the ladder or step just felt more solid when assembled. But the primary reason for this Confer model making the list was versatility. As for price it’s in line with most other in pool steps, maybe a little more expensive. 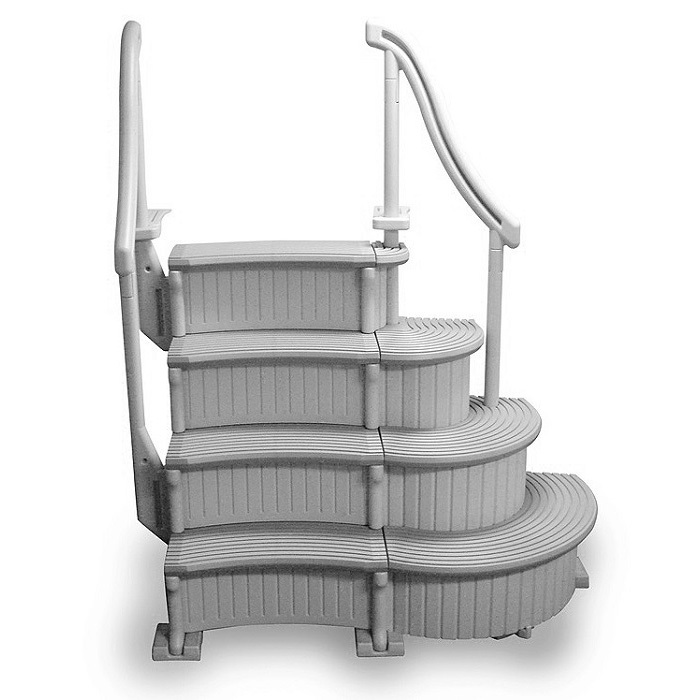 What set this model apart from the others was the ability to make it bigger, it has an add-on piece sold separately that will nearly double the size of the step making it much larger like the wedding cake pool steps of past. Yes, that component adds to the price but even with that figured in it’s still far cheaper than other wedding cake designs. A plus was the edgy modern styling and color. And for those who need a step for inground pools, Confer offers a very similar version for them too. Why It’s Good- Made in USA by Confer Plastics in Tonawanda New York. This is a very old company that has put out good products for many years. The quality of this deck ladder is better than the others. It’s not flimsy or rickety. 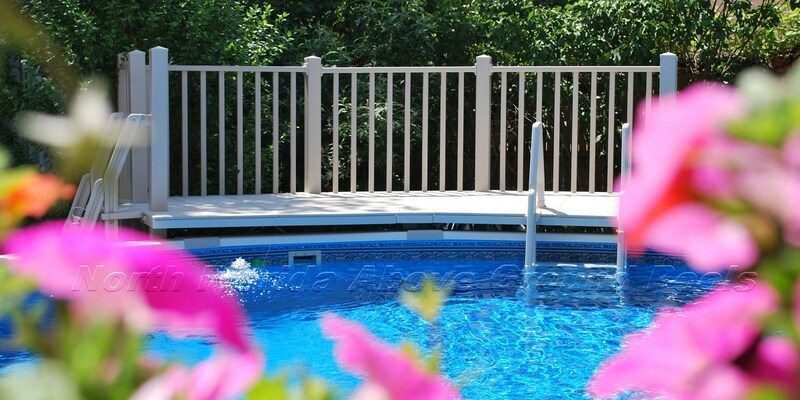 This ladder fastens to the top rail of the swimming pool or fastened to the deck for a very stable pool attachment. 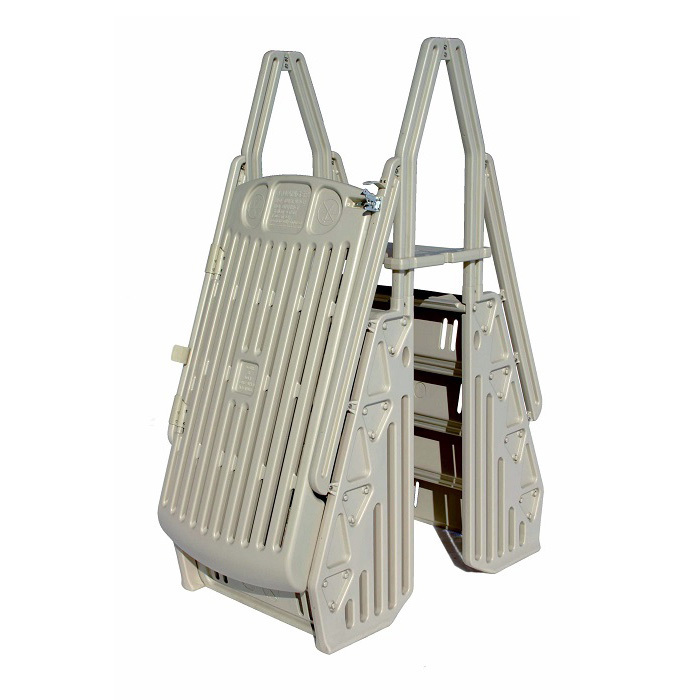 This ladder fits most any 48″-54″ Hard-wall above ground pool and also holds 400lbs. Lastly the rake is good making for easy climbing and the steps are wide and flat. The dual handrails are a plus for added safety. Here it is, the only other brand pool ladder or step to make our list that wasn’t made by Confer. This is a great entry system for any typical above ground pool. It offers step on the inside and outside unlike most systems that use a ladder on the outside. Steps are safer to use as your feet cannot slip through the rungs like a ladder. The gate feature allows you to legally have the steps on the outside and it even comes with a self latching lockable gate. This model is available in various widths and comes in two colors, taupe and white. As to pricing it varies depending on width but it’s in line with other entry systems on the market. The larger Model GE is a bit pricey but a very nice system. Why It’s Good- Made in Ontario Canada by Vinyl Works Canada. This is an old and reputable company that offers a variety of pool ladders, steps and even pool deck systems. The quality of there products are great and they are built to last.